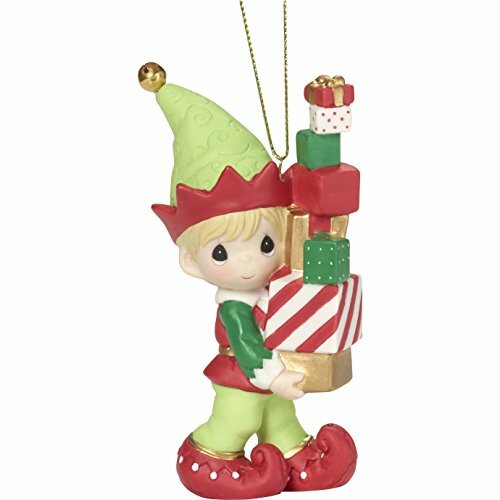 This ornament features the 3rd edition of the annual elf Series, piled high with Christmas cheer as Santa’s helper confidently balances a high stack of festive Christmas gifts for boys and girls around the world! December is bustling, but Santa has it under control with a little help from the elves! one look at this obliging fellow and you can’t help but to imagine all the busy days at the North pole as Santa and his crew count down to Christmas – a fun addition to any tree or tied on to holiday gifts. A memorable Christmas gift for teachers, family members, friends, and collectors who appreciate Precious Moments annual elf figurines, ornaments and snow globes. This 3rd annual elf ornament is meticulously hand-sculpted of fine bisque porcelain and expertly hand-painted. Approximately 4 inches high.